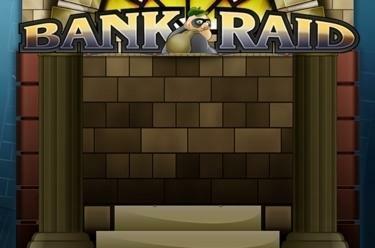 Play Bank Raid online for free now! In the slot Bank Raid with up to 25 lines on 5 reels you can empty the safes of a large bank if you're being clever. The police car symbol scores the biggest winnings for you. The police car acts as Scatter symbol and triggers 10 free games if it lands 3, 4 or 5 times; the position on the reels doesn't matter for this. With the bank robber you can complete your symbol combinations: It acts as a Wild symbol and substitutes for all symbols of the game except for the Scatter. The 10 free games are played with stakes and line numbers of the regular game. 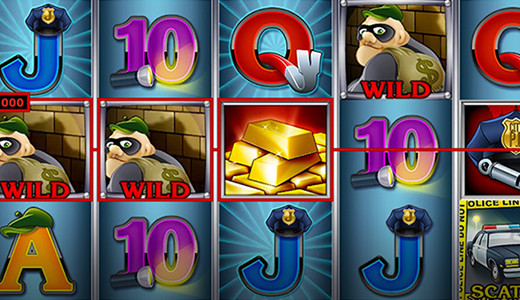 The bank robber symbol (Wild) expands to all reel positions during the free games. Because it can substitute for any symbol (except for Scatter) it might create (additional) winning combos. Additional free spins can be won during free games. Your aim in Bank Raid is to line up 5 winning symbols on one of the pay lines that all run from left to right across the reels. Piling up gold bars, letting coins jangle, counting bank notes - if you like doing this we have just the slot for you: In Bank Raid you nick the riches of a large bank together with a shrewd accomplice. Will you make a run for it without being detected and bring your Twists to safety? If you outsmart the police nothing gets in the way of you living the high life!